Remove Earwax and Heal Ear Infections With These 2 Ingredients! Although it’s never the topic of a social conversation, earwax is a completely natural occurrence. Many of us tend to associate it with being dirty, but its purpose is actually to protect our ears and keep them clean. Earwax traps dust and other small particles to prevent them from reaching and potentially damaging or infecting the eardrum. Everyone produces earwax, but the amounts and types are actually determined by genetics. Warm up 2-3 tablespoons of pure olive oil, in order to make it easier to drain.The temperature should be close to that of your body temperature, which is 98.6 degrees Fahrenheit. Blockages in the ear can trap bacteria, leading to an infection. An essential oil such as garlic oil can be used to destroy the bacteria. Make sure that the essential oil you are using doesn’t irritate your skin in any way. Add 4 drops of the garlic oil or essential oil to the warm olive oil. Stir and use an eyedropper to retrieve some of the mixture. Apply a few drops to the ear while tilting your head to one side. Allow the mix to soak the earwax for about 5-10 minutes. Use on the infected ear or both ears if needed. You may need to repeat the procedure 2-3 times daily in order to see results. The blockage will be broken up and the earwax will be dissolved. You should feel relief within a few days. 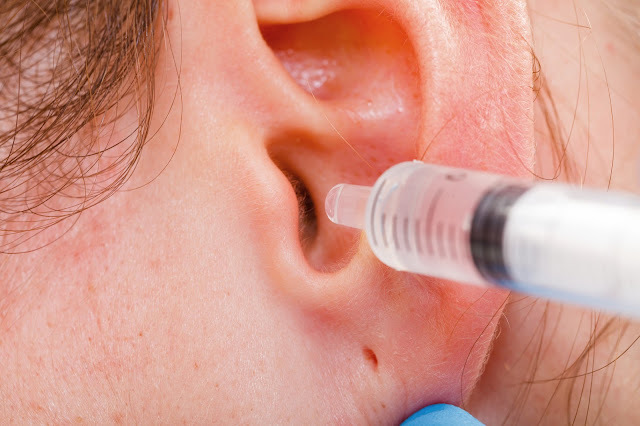 Our ears are capable of cleaning out on their own, but if you are in pain from an ear infection or feel there is too much earwax buildup in your ears, this is a natural remedy to help with the problem. Always consult your doctor to get a proper diagnosis if needed.